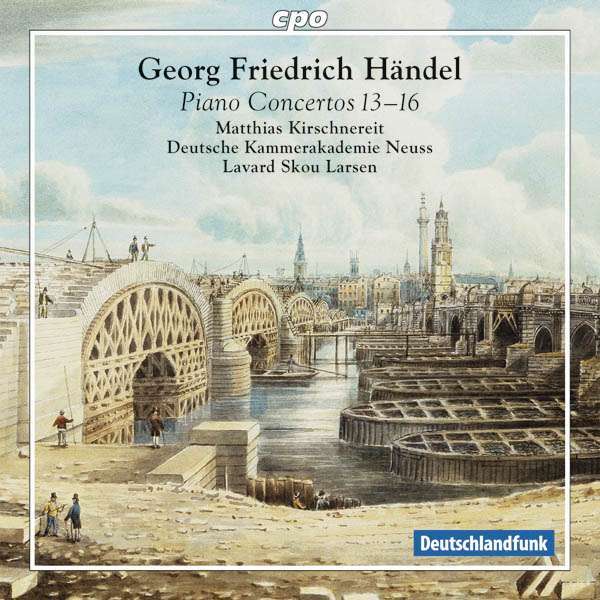 Der Artikel Georg Friedrich Händel (1685-1759): Klavierkonzerte Nr.13-16 (HWV 295,296,304,305a) wurde in den Warenkorb gelegt. Was bei den Cembalokonzerten von J. S. Bach allen Weltklassepianisten ein selbstverständliches Repertoire bedeutet, funktioniert wirklich auch bei Händel: Die positive Resonanz auf unser Vol. 1 (2421387) hat gezeigt, dass eine Übertragung des Soloparts der Orgelkonzerte von Händel auf das heutige Klavier zu unternehmen, eigentlich auf der Hand liegt. Die Presse schreibt u. a. : »Die Einspielung ebnet tatsächlich einen neuen Zugang zu Händel. Beinahe scheint es so, als sei der Zeitpunkt perfekt gewählt. Längst hätten Händels Orgelkonzerte auf einem Klavier erklingen können, doch im 21. Jahrhundert bietet diese Neuerscheinung ein akustisches Refugium besonderer Art.« (ndr. de / kultur 08 / 2013). Johann Sebastian Bach's harpsichord concertos belong to the standard repertoire of all world-class pianists, and the principle operating here also applies to Handel. The positive resonance with which our Vol. 1 (???) has met demonstrates the perfect logic of such a transfer of the solo parts from Handel's organ concertos to today's piano. Members of the music press have written: »The recording does indeed pave the way to new access to Handel. It almost seems as if this particular time had been perfectly selected. 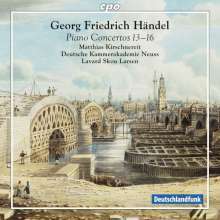 Handel's organ concertos might have been performed on a piano long ago, but in the twenty-first century this new release offers an acoustic haven of a special kind« (ndr. de / kultur 08 / 2013). And: »Here an individual has occupied himself very intensively with the score, examined it closely, and truly arranged it for his own person. Absolutely marvelous moments are the result« (Concerti 11 / 2013). Handel wrote a total of sixteen organ concertos, and six each form the opus groups 4 and 7. 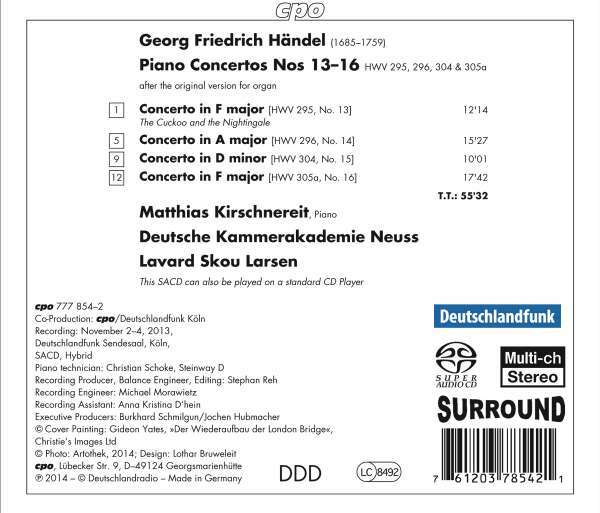 Matthias Kirschnereit has now recorded the four concertos without opus numbers (Nos. 13-16), including the famous F major Concerto popularly known as »The Cuckoo and the Nightingale.« »Pleasure for one and all, without abiding by what elsewhere prevails as a tasteful anchoring in questions of the performance practice of baroque music« (klassik-heute. com).